The National Mental Capacity Forum and Health and Care Research Wales recently hosted the Mental Capacity: Action in Research conference in Cardiff, which aimed to bring together researchers and other key stakeholders (including research participants) from across the UK to develop a consensus about improving access to health and social care research for adults with impaired capacity to consent. The focus was on applying the Mental Capacity Act to key areas of research, including; in emergency and intensive care settings, mental health research, dementias, learning disability and end-of life research. There is a growing recognition that research in these areas is essential to improving treatment and health and social care for all members of society. This has been the focus of recent discussions within the research community in Wales. Researchers and Health and Care Research Wales, together with the Welsh Government and other key stakeholders, have expressed a desire to address the issues of mental capacity in research and move forward with action to facilitate access to health and social care research. 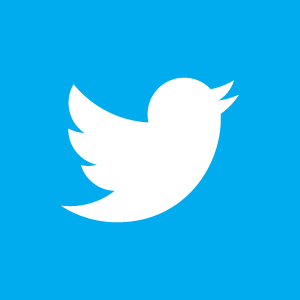 The Centre for Trials Research has conducted clinical trials and a range of other types of research studies involving populations who may experience cognitive impairment, such as older people living in care homes, and people with intellectual disabilities. Our experience in successfully carrying out high quality research with the involvement of our Public and Patient Involvement partners, whilst being sensitive to the ethical and legal protections that safeguard the well-being of participants, meant that we were well placed to contribute to the aims of the event. Our Director (Professor Kerry Hood) and I (Victoria Shepherd, NIHR Doctoral Research Fellow) attended, together with other contributors from Cardiff University, and beyond. Many of us were attending not only as researchers with an interest in this area, but with personal experience of caring for family and friends who experienced cognitive impairing conditions. The full programme is available online. 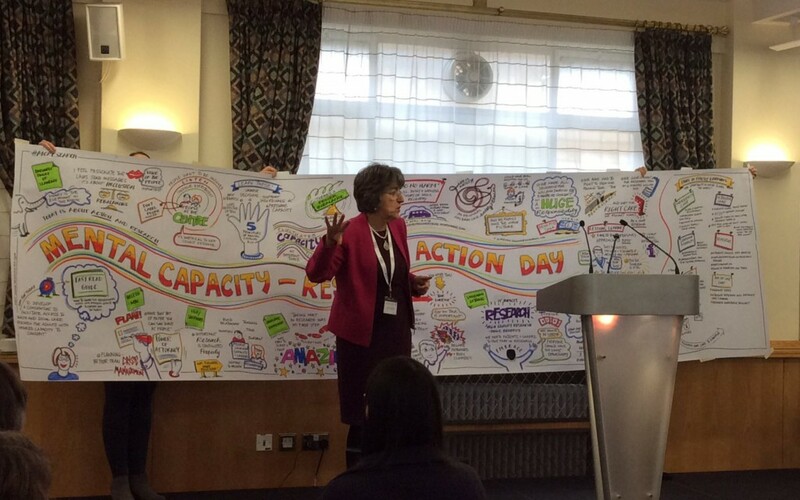 The day, chaired by Sarah Watkins (Head of Mental Health and Vulnerable Groups Policy, WG), began with a keynote speech from Baroness Ilora Finlay who spoke about the 5 key principles of the Mental Capacity Act, and her vital role as Chair of the National Mental Capacity Forum. A series of presentations followed which gave an insight into personal perspectives from Heledd Wyn (legal perspective), me (as a researcher), Charlotte Harding (research participant), and Caryl Kelly (as a carer). These set the scene for a series of ‘issues in practice workshops’ led by research leads in the key areas. Live ‘visual minutes’ creatively captured the themes and content of the day. The afternoon brought a very moving and inspiring keynote speech from William Mieville-Hawkins, a 26 year old teacher who experienced a life-changing event 12 months ago. William, together with members of his family, focussed all our thoughts on the real purpose of the day – anyone can find themselves suddenly in need of the medical treatment and care that the health services provide, together with the ongoing care from the wider multi-disciplinary and social care teams – and the need for this to be underpinned with the best evidence to ensure that the best possible care is provided. William’s amazing story, and ongoing recovery from brain injury can be followed through his blog. The necessity for action was reinforced by Vaughan Gething, Cabinet Secretary for Health, Well-being and Sport, whose contribution underscored the importance and profile of this topic, and the valuable work that we can generate through the unique relationships between the research, governance, and lay communities here in Wales. This can benefit patients, service users, and the public in Wales and beyond. The research leads summarised the key findings from the consensus workshops in each key area, with common themes identified throughout. The day concluded with a call to make a difference, with Baroness Finlay (see below) setting out the next actions from the day. I was asked to contribute as a researcher with experience of conducting research involving people with cognitive impairment, and through my NIHR Fellowship funded by Health and Care Research Wales I am exploring many of these issues. 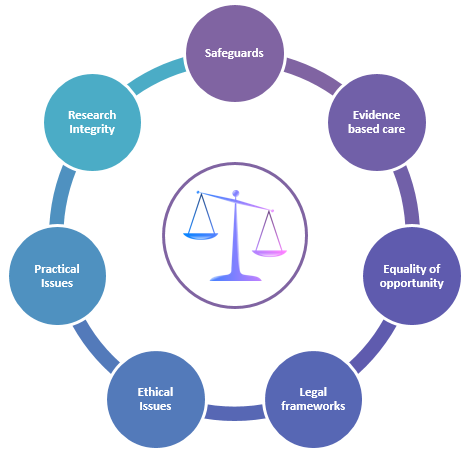 From my perspective, there is a need for balancing the safeguarding and well-being of potentially vulnerable individuals with the need for research to ensure that they receive the best care. As the evidence base can only be improved through research, it is important to understand that populations are made more vulnerable, not less, if they are unable to access research studies. However, there are complex legal, ethical and practical issues involved in research involving people unable to make decisions for themselves. This also needs to be balanced with the need to maintain the integrity of the research itself – this research inform future care and treatment so it is important it is properly conducted and the evidence generated is reliable. My own research focusses on understanding the ethical, legal, and practical issues encountered when families and friends are involved in making decisions about research participation on behalf of a person who lacks capacity to decide for themselves. At present, we don’t know how such decisions are made, or should be made, and there is little support or guidance available. This leads to confusion and uncertainty for researchers, clinicians, and families and friends. 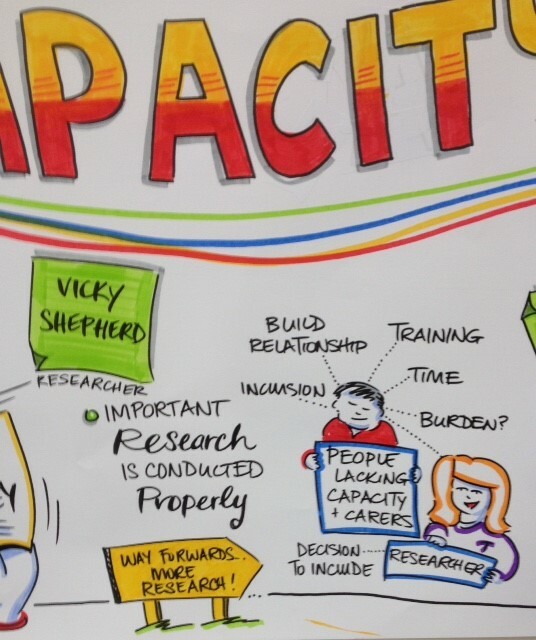 My research aims to explore what factors are involved, how decisions are made, and develop a tool to help support informed decision-making, and the opportunity for people with impaired capacity to take part in research. The event was the start of an ambitious plan from Health and Care Research Wales to address the issues surrounding research involving people with impaired capacity. An expected outcome is to draft core content and good practice principles in order to guide researchers, people with impaired capacity and the public considering engagement with health and social care research. I, together with Kerry and the Centre for Trials Research, look forward to contributing to this exciting work.